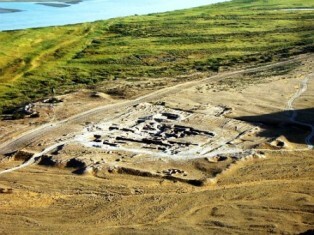 Ancient settlement Takhti Sangin (Oxus Temple) was found during the excavations in1976. This unique structure is located in Takhti Kubad Gorge, at the confluence of the Vakhsh and Panj Rivers. According to sources, the temple was built in the V-III centuries BC. In 1877 the treasure of more than 2,000 gold and silver coins and gold jewelry was found n the right bank of the Amu Darya River. This finding, known as the Amu Darya treasure or ("Oxus Treasure") is in the British Museum in England. It is known that the ancient “Oxus Temple” is dedicated to the deity of the river. During the excavations there were found unique findings: image of Alexander the Great, chests of ivory, decorated with engraved patterns the collection of arrowheads, soldiers’ weapons, as well as many decorations, household items and much more. It is noteworthy that “Oxus Temple” is preserved very well up to the present day. Today unique treasures of “Oxus Temple” can be seen in the National Museum of Antiquities, and the ruins of Takhta Sangin ancient settlement in the picturesque Takhti Kubad gorge.